Fans may have gotten a preview of the KVAC Championships last Friday at the Mt. Blue Relays in Farmington. The Mt. Ararat boys' and girls' teams showed they are the favorites in Class A for the KVAC. There were also great individual races going on as well. On the girls' side it was Katherine Leckbee of Mt. Ararat posting the fastest time of the day, covering the 2-mile layout in 12:36, 10 seconds ahead of runner-up finisher Jillian Richardson of Edward Little (12:46). Molly McGrail of Maranacook was third in 12:59. This was Leckbee's fourth win in as many races as she stays undefeated in 2017. The Mt Ararat girls' completed the relay in 68:35, more than a minute ahead of Maranacook (69:48), and had four of the top nine fastest times to score 35 points in the complete results. Brewer (73:27), Cony (76:06) and Mt. Blue (78:02) rounded out the top five. Taking the top time in the boys' race was Gabe Coffey of Bangor, who crossed the line in 10:45, six seconds faster of Nick Dall of Waterville (10:51). Mt. Ararat's Lisandro Berry-Gaviria was third in 10:57, with Dominic Sclafani of Oxford Hills close behind in 11:05. The Eagles completed the relay in 58:55, with Bangor second in 59:43. Cony was third in 60:11, with Mt. Blue (60:32) and Brewer (60:34) rounding out the top five. In the completed results, Mt. Ararat scored 76 points to outdistance itself from Cony and Bangor, who scored 98 and 99 points, respectively. Mt. Ararat had four of the top 20 fastest times on the day. The Camden Hills girls' and Lincoln Academy boys' were dominant in wins at the Camden Hills Invitational on Friday. The top-ranked Windjammers, fresh off a runner-up finish at Festival of Champions, swept the top three spots and had six in the top eight overall. Grace Iltis covered the 5k course in 19:18.97 to take her fifth win of the season, with Augusta Stockman and Miranda Dunton following. Camden scored just 19 points, and they go into the KVAC Championships this Saturday as the heavy favorite. It was a familiar result on the boys' side as Lincoln Academy swept the top three spots, with Sam Russ leading the win in 17:29.83 -- his fourth win of the season. Jarret Gulden (17:35.93) and David Barnum (17:41.12) followed. Lincoln Academy, no. 4 in the poll, is looking to win its second consecutive Class B KVAC Championship this Saturday. 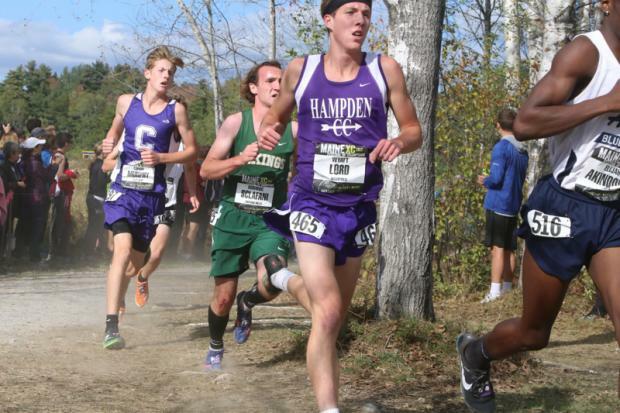 Elsewhere in the KVAC, 10th-ranked Hampden Academy boys' picked up an easy win at the Pendale Invitational at Hermon on Friday. The Broncos swept the top four individual spots, with Wyatt Lord taking the win, covering the 3-mile layout in 16:10.84. Lord's 16:10.84 is the fastest time since Darik Frye ran 16:09 back in 2009 for Hampden Academy. Grahme Sokoloski was second in 16:39.38, with Connor Glowa (16:49.70) and Jason Mathies (17:13.27) following. The Hampden girls' were also victorious, as they got a great race from freshman Ava Dowling, who won in a time of 20:18.12. Freshman Jaymie Sidaway of John Bapst followed in 20:40.78, with Isabelle Jackson of Presque Isle third in 21:17.64. The Broncos took four of the top six spots to score 27 points. 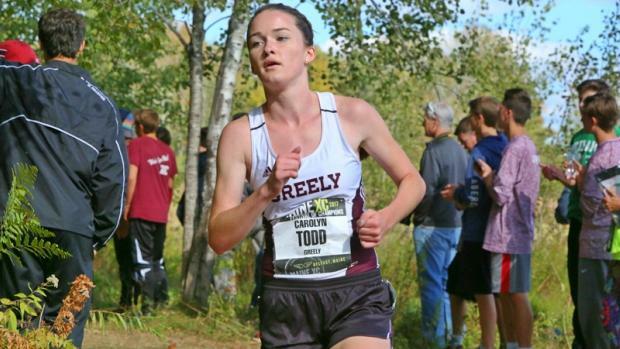 (21:33), Marin Provencher (21:38) and Julia Curran (21:43) of Greely right behind. Both Greely and York, no. 8 in the poll, weren't running at full strength last week. Staying in the WMC, Yarmouth's Luke Laverdiere continued his dominant 2017 campaign as he cruised to an easy win at Pineland Farms in New Gloucester, covering the 5k course in 16:43. Finishing second was Nick Neveu of Maine Coast Waldorf, who was more than 30 seconds back in 17:19. Behind Neveu's runner-up finish, Maine Coast Waldorf placed five in the top 10 overall to score 31 points en route to a decisive win over Yarmouth, who is just outside the Flo50 top 10 poll. 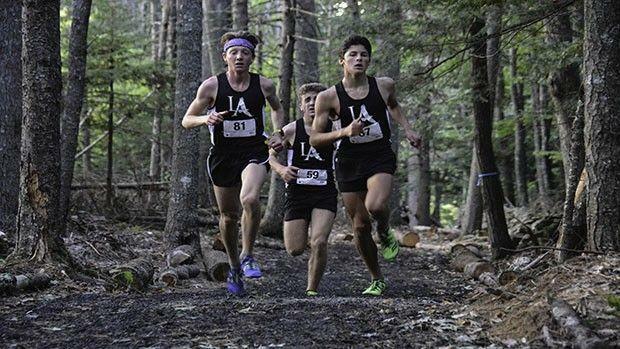 This Maine Coast Waldorf team is deep -- they had three runners run 17:59 or better on Friday -- and should go into the postseason as the top Class C team in Southern Maine. Olivia Reynolds of Maine Coast won the girls' race in 19:37, 13 seconds ahead of runner-up Emily Carty of Fryeburg (19:50). Fryeburg put four in the top seven to pick up the win. Wells senior Mitch Libby continued his fine season with another victory last Friday at Traip Academy in Kittery. Libby covered the 3-mile course in 16:27, over 30 seconds ahead of runner-up finisher, Jack Bassett of Cape Elizabeth (16:58). Libby led the no. 6 Warriors to a 27-41 win over Cape Elizabeth. Libby has had an outstanding 2017 season having, won five out of six races. 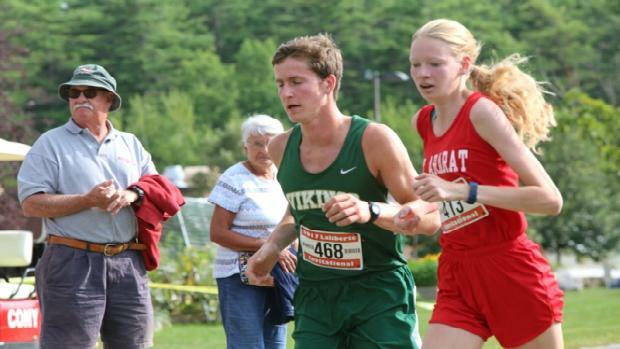 His only loss came at the Southern Maine XC Classic in early September where he was third in 16:10. He's also one of two runners this season to have broken 16:00 after he ran 15:59.26 almost two weeks ago at Freeport. On the girls' side, it was Cape freshmen Lila Gaudrault taking the race in 20:26, with teammate Camilla Grosso second in 21:42. The no. 6 ranked Capers took eight of the top 10 overall spots to score just 18 points. The no. 5 ranked Scarborough boys' must be pleased to have Connor Coffin back and healthy. After an injury slowed the start of his 2017 season, Coffin appears to almost be back to full strength as he won his first race of the season at Smiling Hill Farm on Friday, running 16:41.40, two seconds ahead of teammate Tristram Coffin (16:43.70). Alexander Swett of Massabesic was third in 16:55.00, with teammate Jacob Aboud fourth in 17:18. The Red Storm edged the no. 8 Mustangs 32-34. With Coffin back in the mix, Scarborough has as strong a top four as any team in Class A -- its top three runners have season bests of 16:51 or better, with Luke Grover not too far back in 17:09. However for them to regroup to its typical state championship form, they'll need its five and six runners to step up. The Massabesic girls' took care of business, as they put five runners in the top 11 overall to beat Scarborough, 35-44. Kylie Johnson led the way for the Mustangs with her runner-up finish as she crossed the line in 20:06. Bethany Sholl of Scarborough won the race in 19:28.70. It was the second win of the season for Sholl, who has run under 19:30 for 5k four times this season. She should definitely be considered an individual candidate at the Southern Regional on October 21. The Deering boys' and girls' teams were dominant in wins on its home course in Portland last Friday. The Deering girls', who are sitting just outside the Flo50 poll, had a perfect score, with Nicole Whipkey leading the charge in 19:35. Freshman Sierra Aponte-Clarke was five seconds back in 19:40. It was Whipkey's second win of the season. The Deering boys', no. 3 in the poll, swept the top three spots, with Alec Troxell winning in a course-record time of 16:20. He was three second ahead of Yahya Nure (16:23), while Jerry Mixangelo was third in 17:00. This was Troxell's third win of the season, and marked the fourth time he's run under 16:40 for 5k in 2017. Both the boys' and girls' teams have a tough week ahead as they'll head to South Portland on Friday along with Falmouth. The Falmouth boys' and girls' are both ranked in Flo50 polls. It will be interesting to see if both Deering and Falmouth choose to race full-strength with the Southern Regional just eight days later. Speaking of Falmouth, both the boys' and girls' teams collected wins at Marshwood High School on Friday. The Falmouth boys', no. 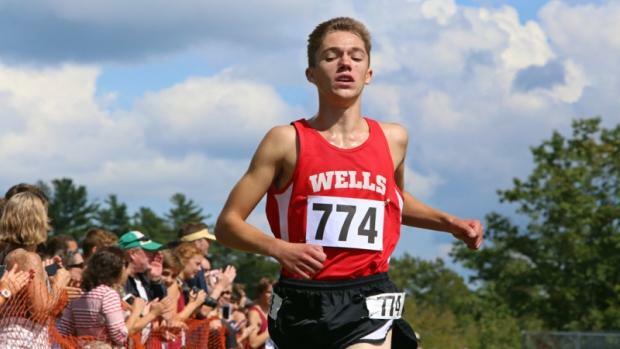 1 in the poll, rested its top three Connor Piers, John Auer and Charlie Henning, but still swept the top three spots, with Benjamin Potter taking the win in 17:46. Alex Kinley was second in 17:49 with Kade Kelley a second back in 17:50. The Yachtsmen now have six runners who have run 17:50 or better for 5k this season. Sofie Matson won the girls' race, stopping the clock in 18:49 -- the fourth time she's gone under 19:00 in 2017. 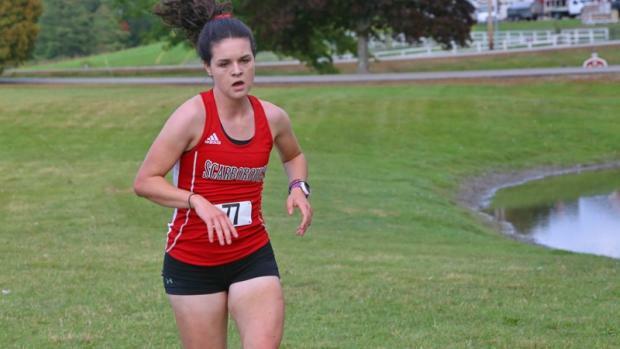 Malaika Pasch bounced back from a DNF at Festival of Champions with a strong runner-up finish, finishing in 20:19. 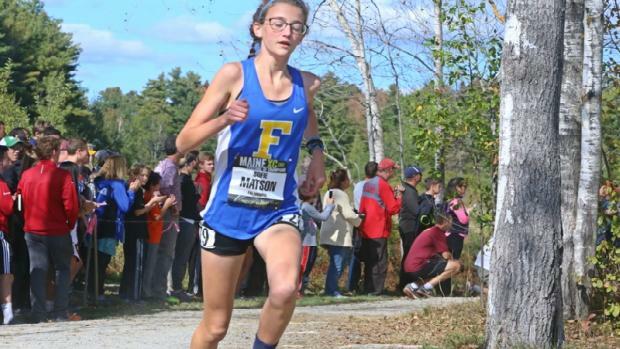 Getting her back to full strength will be the biggest focus for Falmouth if they have a chance at winning a state title. The Yachtsmen defeated Marshwood 24-33, despite resting Karley Piers, who has been their dynamic second runner all season. Mackenzie Young led Marshwood with her third place finish (21:03).